Welcome to the seventy-first issue of MetaboNews, a monthly newsletter published in partnership between The Metabolomics Innovation Centre (TMIC, http://www.metabolomicscentre.ca/) and the international Metabolomics Society (http://www.metabolomicssociety.org/), to keep metabolomics researchers and other professionals informed about new technologies, software, databases, events, job postings, conferences, training opportunities, interviews, publications, awards, and other newsworthy items concerning metabolomics. MetaboNews represents the one-stop-shop for the very latest and most critical news about the science of metabolomics. 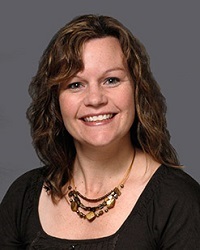 In this issue, we feature a Metabolomics Spotlight article from researchers at Metabolomics Australia titled "MASTR-MS: a web-based collaborative laboratory information management system (LIMS) for metabolomics", and a metabolomics interview with Nichole Reisdorph of the University of Colorado. We are excited to announce that the 14th Annual Conference of the Metabolomics Society will be held in Seattle, Washington, United States from 25-29 June 2018 at the Washington State Convention Center. Congratulations to Prof Daniel Raftery and his local organising committee for preparing the winning bid to host the conference in Seattle. The 2018 conference will offer fantastic opportunities for metabolomics researchers, across all career-stages and disciplines, to network and share the latest advances in our field, whilst enjoying the natural beauty of Seattle and its surrounds. Keep an eye on the website for key information and dates (http://metabolomics2018.org). We look forward to seeing you in Seattle next year. Are you interested in hosting the 2020 Metabolomics Conference in Asia? The Metabolomics Society will soon be calling for Expressions of Interest from members that are keen to host the annual conference in 2020. The conference location rotates through the major regions of the world, and in 2020 we plan to return to Asia. Please ensure that your Society membership is up-to-date to be eligible. Full application details will be emailed to members in the coming weeks. Well the first thing to say is I haven’t had to chair a Board of Directors teleconference this month and that’s because in a few hours time we will be meeting in person ahead of the 13th International Meeting of the Metabolomics Society in a very sunny Brisbane. I have just finished my welcome slides and look forward to welcoming 520 delegates from 34 countries. Melissa Fitzgerald, Horst Joachim Schirra and team have done a fantastic job of pulling together an exciting and innovative programme, and I would also like to say a big thank you to Darren Creek for chairing the conference and training committee, for his role in acting as the central link between the Board of Directors and the Organizing Committees of the conference. Darren is about to finish his term as chair of the Conference and Training Committee. The Committee itself is in the process of metamorphosing into two separate committees. Sastia Putri will chair the new Conference Committee while Christophe Junot will chair the new Training Committee. I have many more people to thank but that’s slide 26 of the opening slides. So for now I’m going to keep this short and look forward to welcoming many of you to Brisbane! MEMBER OF THE METABOLOMICS SOCIETY? HELP THE METABOLOMICS SOCIETY HELP YOU! Do you want the Metabolomics Society to know how to create better opportunities and improved benefits for members? We want to know what you think! Take 10 minutes to help the Metabolomics Society help you by completing a short survey! Those who participate will be entered to win $200 Amazon gift card! And, the greater the number of responses, the more gift cards we’ll give away. Thus, encourage your colleagues to take the survey! The Metabolomics Society would like to know how to better serve non-members and potential new members and we want to know what you think! Take 5 minutes to help the Metabolomics Society by completing a short survey. Those who participate can win a $200 Amazon gift card! And, the greater the number of responses, the more we’ll give away. Encourage your colleagues to take the survey! In the next few months, the Metabolomics Society will undertake the annual process of nominating and electing new members to serve on the Society’s Board of Directors. We strongly encourage all Society members to play a role in nominations and elections. The Society is led through the voluntary efforts of the Board of Directors. While this provides motivated individuals a fantastic opportunity to contribute to the activities, communications, and ultimately growth of our metabolomics community, it also requires a time commitment of typically two hours per week. In addition to tasks orchestrated through the monthly Board Meeting, each Director is expected to serve on at least two committees or task groups, and, in many cases, to lead and chair such a group (for the current committees and task groups, see http://metabolomicssociety.org/). Full details of the nominations process will be made available on the Society’s website in the near future. Please keep in mind that the Society is an international organization involved in a wide range of subjects in the field of metabolomics. 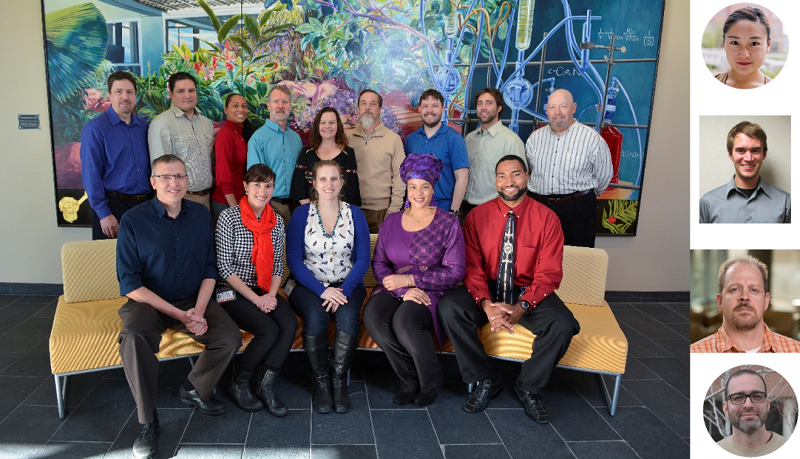 Our directors will serve us best if they reflect the diversity of backgrounds, expertise, interests, and geographic distribution of the many individuals who comprise our membership. In brief, (1) all individuals nominated must be current members of the Metabolomics Society, and (2) at least two members of the Society must support the individual’s nomination. If you wish to nominate an individual to stand for election to the Board of Directors, please fill in the form available at http://goo.gl/forms/8oksEwC4224ZWHGF3. Nominees will be required to provide a short biography and statement of purpose by the end of July. Guaranteed to cause excitement and annoyance in almost equal measure, the Analytical Scientist’s often controversial Power List has become an annual talking point within the field and wider scientific community. This year, rather than only one category, there are ten categories including Omics Explorers, Separation Scientists, Spectroscopists and Mass Spectrometrists. There are plenty of categories that metabolomics and lipidomics colleagues could nominate and be nominated for. There is no limit to the number of nominations you can submit. See https://theanalyticalscientist.com/issues/0517/the-power-list-2017-10-top-10s/ for more information and follow the link at the bottom of that page to vote. This would be a great chance to get omics some well-deserved recognition. MASTR-MS is a comprehensive web-based LIMS solution specifically designed for metabolomics. It can be deployed either within a single laboratory or in a geographically distributed multi-laboratory setup. The system captures the entire sample processing pipeline starting from project and experiment design to sample analysis, data capture, and storage. It acts as an electronic notebook, facilitating project management within a single laboratory or a multi-node collaborative environment. MASTR-MS comprises five major modules, a Node Management System, a User Management System, a Quote Management System, a Project Management System, and a Data Management System. The Node Management System allows this LIMS to be used in either a single node/laboratory or by a multi-site, collaborating laboratories/consortium. The User Management System manages the creation process of users, setting user privileges and assigning users to specific Nodes. MASTR-MS has six different user groups: Systems administrator, Administrator, Node representative, Project leader, Staff, and Client. The different user groups have a varied set of read, write access to projects and experiments. 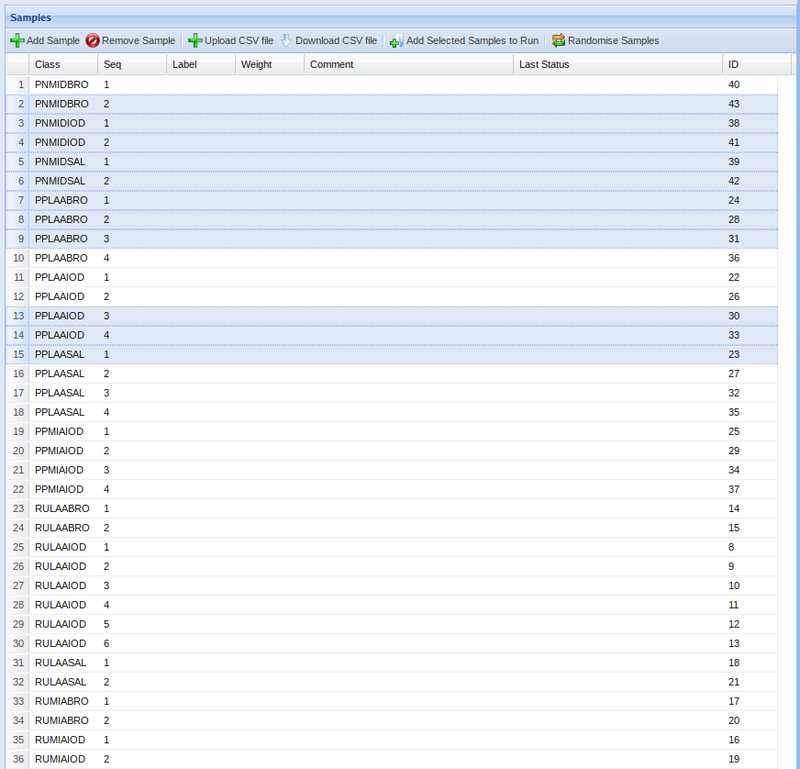 The Quote Management System, which provides utility for Metabolomics labs that operate a service delivery model, manages queries made by clients and any associated quotes that are issued by the labs. The quote request and response is linked with the client details, the specific project, experiment, sample, run and resulting data, thus bringing together all components that make up the life cycle of a sample. The Project Management System manages the metadata along with all aspects of project management, including project setup, experimental setup, sample tracking and finally the sample list generation, which would be used as the sequence list to run the analytical instrument. The Data Management System allows the automatic capture and storage of raw and processed data from the analytical instruments to MASTR-MS. Importantly, the generic design of the data management component of MASTR-MS ensures that it can be used with instruments from different vendors. MASTR-MS is also being used as a LIMS solution for other data-rich technology platforms, such as proteomics, NMR, and high-resolution imaging. MASTR-MS already has considerable community support and new features will continuously be incorporated, including the capacity for researchers to directly upload their metadata and data to public metabolomics repositories such as MetaboLights and the Metabolomics Workbench. In addition, a reporting and export function is being developed at the user level, enabling the user to query the system and download data. In order to make automatic querying and retrieval easy, an API for MASTR-MS is being planned as well. MASTR-MS: a web-based collaborative laboratory information management system (LIMS) for metabolomics. Hunter A, Dayalan S, De Souza D, Power B, Lorrimar R, Szabo T et al., Metabolomics. 2017;13 2:14. Figure 1. 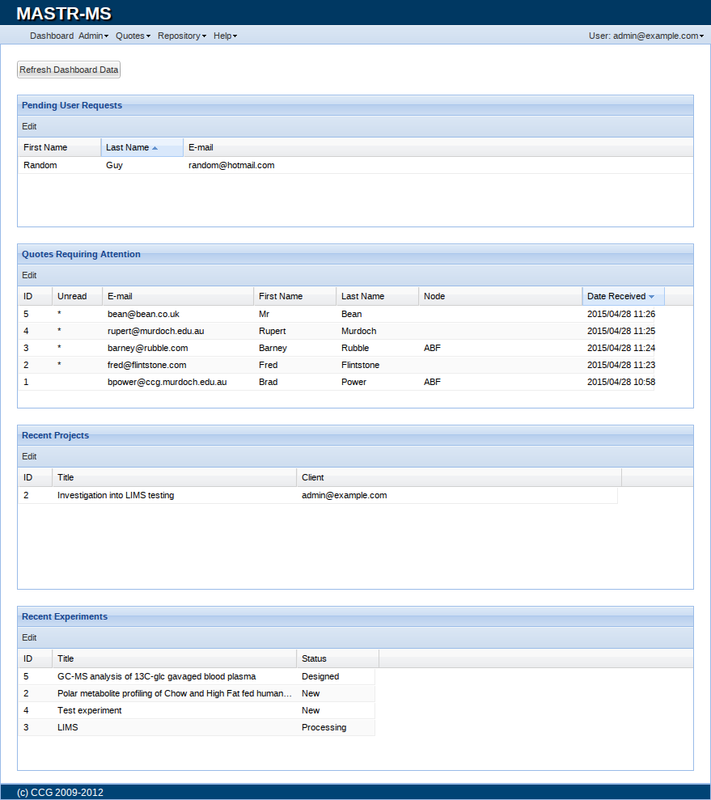 The Dashboard of MASTR-MS showing the logged in user’s user requests, quote requests, recent projects and experiments. Figure 2. 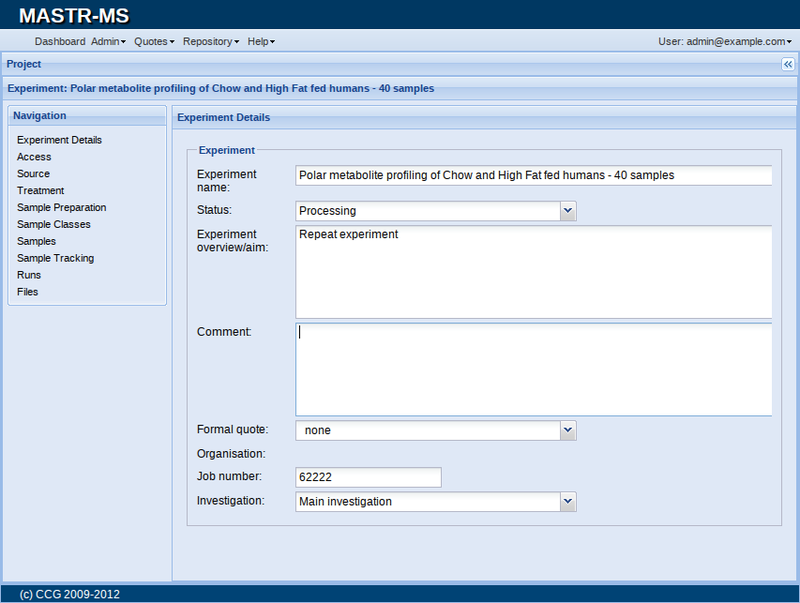 MASTR-MS portal where project, experiment, sample and run details along with meta data are captured. Figure 3. MASTR-MS feature in which all samples belonging to an experiment is displayed, from which a subset can be selected for a single run. Figure 4. 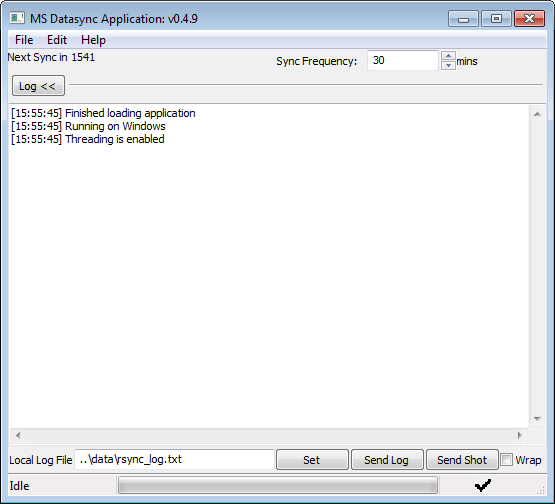 The data sync client that is run on acquisition computers, which is responsible for the automatic collection and transfer of raw data from the acquisition PC to the MASTR-MS storage. This section features interviews with prominent researchers in the field of metabolomics. The aim of these interviews is to shed light on metabolomics researchers around the world and give them an opportunity to share their metabolomics story. In this issue, we feature an interview with Nichole Reisdorph. I am an Associate Professor in the Department of Pharmaceutical Sciences at the University of Colorado, Anschutz Medical Campus. My research applies mass spectrometry to projects that are of therapeutic relevance to human diseases. While my lab’s main research focuses on systems approaches to understanding lung disease, our numerous collaborative efforts span from microbiome and toxicology research to exercise physiology and diabetes. Our laboratory and core facility have robust platforms in metabolomics, proteomics, and bioinformatics; these are applied to a very broad expanse of fields and interests. In addition to my metabolomics background, I have extensive organizational and fiscal experience that I’ve previously used to serve the mass spectrometry community. This includes co-founding and serving as Treasurer for the Colorado Biological Mass Spectrometry Society (www.CBMSS.org). During my tenure, I was responsible for establishing the CBMSS as a non-profit organization, writing by-laws, setting up and managing money accounts, and providing financial statements to the Board and federal agencies. My fiscal experience includes managing a large core facility comprised of 18 scientists and students, co-organizing the 2010 United Stated Human Proteome Organization (US HuPO) meeting, and leading an internationally recognized Metabolomics and Proteomics training program. NR: I did my post doc in Dr. Gary Suizdak’s laboratory at The Scripps Research Institute in La Jolla, CA, USA. I was responsible for setting up a proteomics workflow; however, I also helped a colleague, Dr. Elizabeth Want, test some protein precipitation methods as part of a new direction the lab was taking, namely metabolomics. Everything was very new, including Gary’s visions for Metlin and XCMS. When I started my own mass spectrometry lab, metabolomics was a natural complement to our proteomics work. The power of metabolomics, in our case when applied to human health, was immediately clear. We spent the first few years developing and validating robust and reproducible assays and informatics workflows. While we now focus predominantly on metabolomics and lipidomics, we still do some proteomics. NR: My research focuses on applying metabolomics to projects that are of therapeutic relevance to human diseases; we specifically focus on lung diseases. One of our most exciting projects is determining if small molecules can be used to determine response to asthma medication. This work focuses on two human cohorts of almost 1,000 individuals in total, giving us adequate sample sizes to test various hypotheses. We had previously found that a leukotriene could be used to predict response to one asthma medication; however, additional molecules are required to strengthen the model. Metabolomics enables us to take an unbiased approach to this type of biomarker discovery; our relatively deep coverage of the metabolome also allows us to understand mechanisms of disease. Our initial data in urine is very promising and we are currently analyzing data from matched plasma samples. This project is also allowing us to determine the impact of the exposome, specifically air pollution and PAHs, on the metabolome. Another project uses a systems biology approach to determine mechanisms responsible for chronic obstructive pulmonary disease (COPD). This project is enabling us to sample individuals across time points to determine how disease progresses. Combining genomics and metabolomics datasets has allowed us to push the edge of informatic and statistical approaches! As Director of the Mass Spectrometry Facility at the University of Colorado School of Pharmacy, I collaborate with others in supporting their metabolomics work. For example, we collaborate with groups focusing on epilepsy, alcoholism, multiple sclerosis, diabetes, obesity, cancer, and several others. Since metabolomics provides high coverage of human metabolism, we are able to compare results across disease states, from animals to humans, and between biofluids. This truly gives us a wide perspective on the role of small molecules in human disease! The figure below shows how metabolomics technologies can be used to capture the effects of various elements on the metabolome and how this information can be used to improve human health. Our laboratory is involved in projects that focus on the exposures shown in red font. Figure 1. Power of metabolomics to capture effects on the metabolome. Partial credit to Dr. Yasmeen Nkrumah-Elie for figure ideas. NR: Our campus recently created the Division of Biomedical Informatics and Personalized Medicine (BIPM), which is Directed by Dr. Kathleen Barnes. 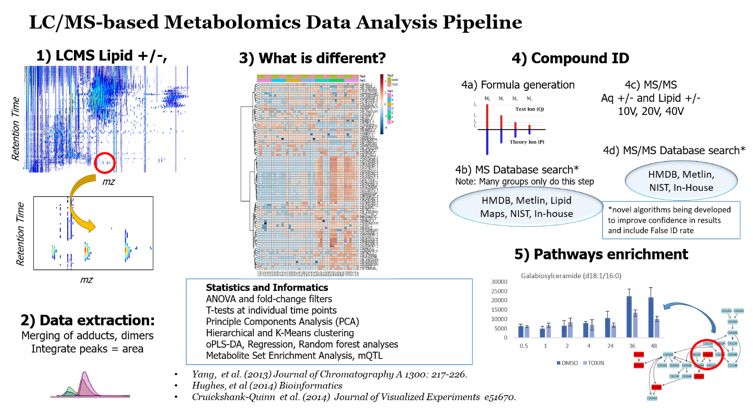 Our collaborative efforts with the BIPM includes developing a bioinformatics pipeline that enables interpretation of as much of our metabolomics datasets as possible. We are also working on mQTL strategies to determine genetic regulation of metabolites in both highly controlled and asthmatic groups. Within the BIPM and the SOP, we are integrating data from microbiome and metabolomics studies that focus on a range of human diseases, including asthma. Finally, we are working closely with our Nutrition center to develop a Foodomics program. NR: Our National Institutes of Health (NIH) have invested considerable resources into a Metabolomics Common Fund. The Common Fund sponsored 5 Regional Metabolomics Centers that have enabled a number of high quality pilot studies and educational opportunities. Additional funds were used to support supplements to add metabolomics to existing studies. Our laboratory received several of these awards that were used to develop new collaborations and train young investigators how to incorporate metabolomics into their research projects. Since these have now been in place for a few years, we are now starting to see the results of more mature studies that evolve from these pilot grants. Informatics strategies, especially those that enable cross-study comparisons, are also underway through these Centers. The NIH has recently re-issued the Common Fund and several new program announcements will soon be released as part of this renewal, including data repositories and informatics centers. Feel free to visit https://commonfund.nih.gov/metabolomics for more details. NR: Following validation, the results from several of our human studies can be directly translated into clinical tests. A significant portion of our laboratory’s effort focuses on targeted small molecule analysis which lends itself to clinical assays; using metabolomics as a discovery tool makes clinical implementation more straightforward since the same platform is used. Since the field is still relatively new, the development and validation of workflows and informatics strategies have potential for application in a number of future studies. We are fortunate in having access to clinical cohorts of sufficient size and with repeated sampling; therefore, our work can help guide others as metabolomics is applied to other cohorts. NR: A major strength of metabolomics is our ability to provide comprehensive coverage of hundreds to thousands of molecules from various classes, greatly improving biomarker discovery capabilities. Importantly, metabolomics can capture both endogenous and exogenous information. Small molecules provide information on the past, present, and future state of our metabolism; this will be especially evident as more longitudinal clinical studies are performed. Metabolomics is highly complementary to all other ‘omes and mass spectrometry allows for robust and reproducible assays to be developed. Perhaps one of metabolomics greatest assets is our community, where collaborative, international efforts are driving the field forward. NR: I feel that the greatest of all Grand Challenges remains our limitations in compound identification. This results in a large amount of redundant efforts in confidently identifying single biomarkers of interest. Another major challenge lies in the full utilization and interpretation of our datasets. This is due to a number of factors; for example, the numbers of comparisons being made can result in the failure of individual molecules to pass significance thresholds, especially when multiple testing correction is applied. Genomics strategies have been attempted to some degree in metabolomics, although their application has been relatively limited in clinical metabolomics studies. One possible explanation for this is that standard and widely accepted gene ontologies and pathways are necessarily gene-centric. However, small molecules cannot always be related to a single gene; metabolites often serve multiple functions, and these functions can be difficult to define. Conversely, large numbers of small molecules can also share a single function; for example, in the Human Metabolome Database (HMDB), hundreds of phospholipids are assigned the function “membrane structure and integrity”. This makes it impossible to distinguish between the functional roles of individual phospholipid species, with an inherent risk of treating all species alike. Because proteomics can be thought of as “functional genomics”, genomic informatics strategies often work for protein datasets. Metabolomics, on the other hand, focuses on small molecules whose roles in the cell are often only indirectly related to genes or proteins. The result is that pathway analysis routinely results in matching to a gene-centric pathway where only one molecule out of dozens is a metabolite. In addition, to date, pathway tools do not take the highly diverse chemical nature of small molecules into consideration. While progress is being made on both of these issues, we have not yet fully realized potential of our international community to solve them. And while these are currently major challenges, these can also be considered opportunities for metabolomics scientists to develop novel and innovative strategies! Cross platform comparison of both data acquisition and analysis workflows will enable us to compare results across studies. This may also lead to some standardization of methods. Metabolomics has proven itself capable as a biomarker discovery platform, now we are ready for more complex studies; these include population-based studies and those incorporating multiple-omics platforms. Informatics and statistical strategies must be developed that can handle nuances of metabolomics data and make more complete use of our datasets. New tools that integrate data from microbiome and human metabolome studies will be of immense value to both fields. While individual efforts are being made, more of an international effort to provide educational opportunities, both hands on and web-based, will really help to drive the field forward. We’ve been offering hands on courses for over 10 years and can attest to the importance of these endeavors. I’m excited by the fact that the Metabolomics Society is now prioritizing training and education. As our President, Dr. Jules Griffith says, “Watch this space!” to learn more as these efforts evolve. NR: I’m afraid scientific research may be taking a big hit in the United States, not just in metabolomics but in all areas. It’s a bit of a wait and see right now while our government wrangles over budgets. Assuming the levels of funding for scientific research stay level, my opinion is that metabolomics projects will continue to be funded. Our NIH has already committed a large amount of “Common Fund” dollars to this technology. Results from pilot studies have proven that this is a powerful technology and a great investment. Within the Metabolomics Society, I see a desire to integrate programs on a global scale to make better, more efficient use of funds. So overall, my opinion that is the future of metabolomics is very bright. NR: As mentioned above, standardization is critical for metabolomics to continue to move forward. The best technological platform is one that can be reproduced across laboratories. Standardization does not mean that we all have to do things exactly the same. To me it means that my methods are robust and reproducible and of high quality. This is absolutely essential if we are to be able to compare results from studies across time and space. NR: Metabolomics is still a relatively new field. There is a lot to be learned from other fields including, proteomics and genomics. If we wish to make a lasting impact and realize the full potential of metabolomics, we need to be diligent in our methods. And we need to talk as broadly about what didn’t work as what did work for us. There is no need to make a colleague repeat our mistakes. Fortunately, I feel that metabolomics researchers are a highly collaborative bunch! We are also truly international community, with inter-continental efforts helping to drive the field forward. But mostly, I would encourage everyone in the field, both new and established to please do get involved!! There are a lot of opportunities to participate in solving Grand Challenges, in training and education, and in disseminating information to other fields. The Metabolomics Society and our international affiliates provide a great platform for new ideas to be heard. Check out the website or send along an email if you would like to hear more. The Metabolic Phenotype of Prostate Cancer. Metabolic profiling of type 1 diabetes mellitus in children and adolescents: a case-control study. Analyses of SLC13A5-epilepsy patients reveal perturbations of TCA cycle. An exposome perspective: Early-life events and immune development in a changing world. Metabolomics combined with pattern recognition and bioinformatics analysis methods for the development of pharmacodynamic biomarkers on liver fibrosis. Volatile compounds in blood headspace and nasal breath. Identification of urine metabolites associated with 5-year changes in biomarkers of glucose homoeostasis. Comprehensive analysis of the tryptophan metabolome in urine of patients with acute intermittent porphyria. The impact of moderate altitude on exercise metabolism in recreational sportsmen: a nuclear magnetic resonance metabolomic approach.